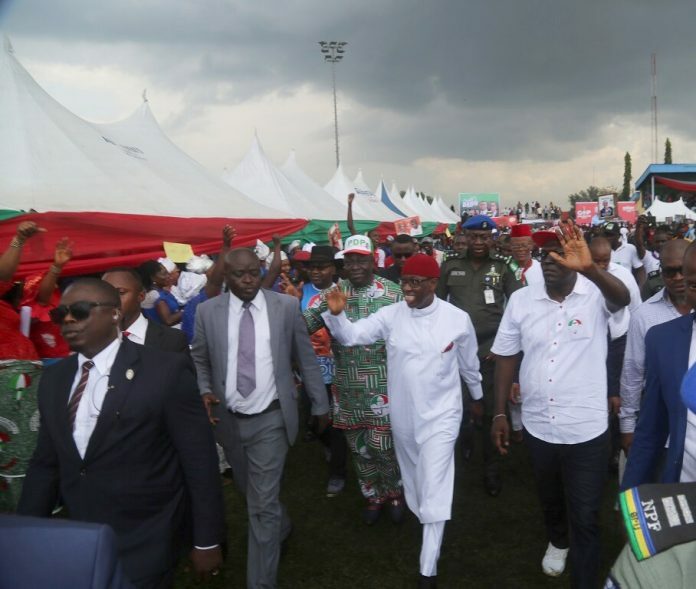 In Delta CentralNo fewer than five thousand Politicians, on Wednesday, decamped from the All Progressive Congress (APC) to the Peoples Democratic Party, (PDP) . DELTA State Governor, Dr Ifeanyi Okowa and the Chairman of PDP, Kingsley Esiso while receiving the defectors, observed that PDP will have a smooth sail to victory in the 2019 general elections. “It is a thing of joy that those who we described as big fish in the opposition have come to join us in the PDP,” Governor Okowa said adding that “with these persons that have joined us today, it is a smooth victory for PDP in 2019”. He commended those who decamped to the PDP, disclosing that with the work his administration was doing in the state, the few persons remaining in opposition political parties will join the PDP before the 2019 general elections. Ideh, Ofomona, Johnson, Oteri, Umunedi, in their separate speeches, disclosed that they were attracted to the PDP by the leadership style of Governor Okowa’s administration, especially in the delivery of democratic dividends across the state.